I hate it when you build up a place in your mind and it doesn’t deliver. I’ve already review after review of how amazingly wonderful Mark Hix‘s Soho establishment is. From the oysters to the drinks menu to well, everything. Sadly, it didn’t work so much for me. I went for a client lunch (one of the benefits of agency life), giddy at the prospect of not having to pay for what I was sure would be quite an expensive meal. Always nice. Service from the beginning was top-notch. Though it certainly wasn’t busy on a Monday lunch, the professionalism of the staff shone through. Pleasant, courteous and attentive. The rest (apart from one bright spot), was lacklustre. It’s still a bit early in the season for asparagus, but this was fine all the same. Not mind-blowing, but good. 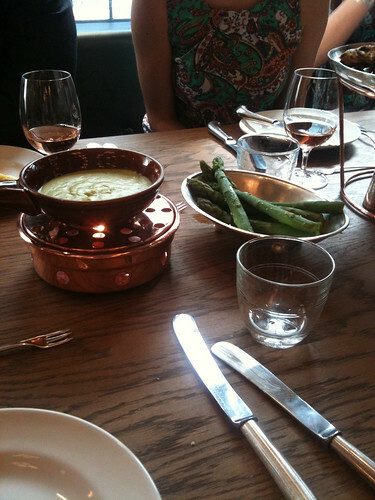 The cheese was whipped with an asparagus cream that complimented the (slightly overcooked) stems nicely. Oysters were lovely (apologies for the missing photo – the picture did not come out as I surreptitiously tried to take a photo from across the table), but as I’ve said before, I’m no expert. I just know I liked them more than the ones at The Warrington. Talk about false advertising. 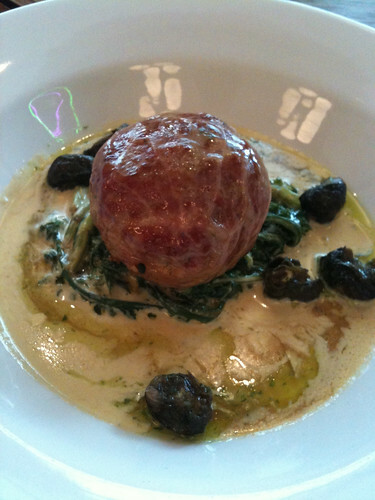 Instead of Veal Dumpling, the menu should have read, ‘Huge, giant, ball of salty minced cow’. Even for me, it was too much. What is generally lovely and tender about veal was completely absent. It was so dense, I had a hard time cutting it, let alone eating it. The cream sauce was so heavy with oil and butter, I could nearly hear my arteries clogging with each bite. I tried to dillute the salt with a side of potatoes, but even those were so soaked in butter, it pretty much made things worse. In fact, all around the table, the feedback was similar. Apart from the Fish Fingers, which were apparently ‘awesome’, we all found our mains to be overly saturated with fat, overly salty and overall mediocre. Although the experience ended on a sweet note, I just couldn’t help feeling completely disappointed. I didn’t get a chance to see the final bill, but I can’t imagine it being a cheap affair. Perhaps I just had a bad experience, but I’m not willing to pay out-of-pocket just to find out. Tagged as hix restaurants, hix review, hix soho, mark hix, oysters, what's hix like? That ice cream looks divine! 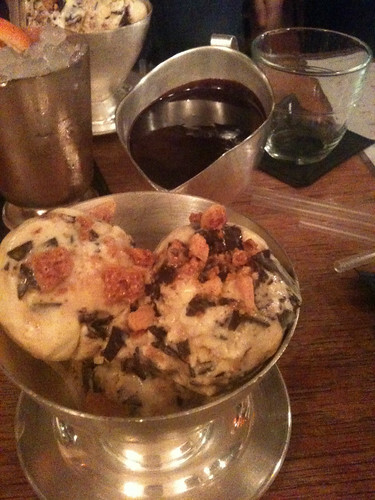 Reminds me of a high-end version of “fried ice cream” at Mexican restaurants. Sorry about the rest of the meal, bummer dude. Thank heavens, I thought it was just me. I haven’t eaten at Hix in Soho, but had a poor meal at Hix in Lyme Regis. The views were great, but the table way too tiny for three people, the food overpriced, good enough but not the calibre to support those prices, the attitude of the staff was cool and distant. It just felt like a stylish ripoff from start to finish. Don’t know what all those breathless reviews were about, but the Hix magic definitely wasn’t working.